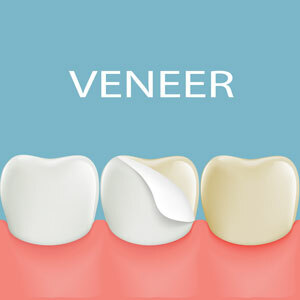 Veneers involve a thin shell of ceramic bonded to the surface of your existing teeth. At St Clair Dental, we offer stunning, custom-made veneers from an experienced team using only the highest quality of materials. Your smile will be transformed into a more aesthetically pleasing look that lasts for years. The shape, colour, and appearance of your teeth can be altered with veneers. A wafer-like material applied to the front of the teeth can repair many forms of wear. They also work well for those who haven’t had success with whitening teeth. There are two types of veneers: composite or porcelain. Composite veneers need minimal tooth preparation but may be subject to staining over time. Porcelain veneers, though requiring more preparation of existing teeth, are more stain-resistant and long-lasting while giving a translucent, natural appearance. We’d be happy to assess your oral health and make recommendations on which is most appropriate for your situation and desired objectives. Schedule your appointment with us by phone or email! We’re open late and offer complimentary parking on-site.